West, J. Thomas. "Jean Wilson". The Canadian Encyclopedia, 07 February 2018, Historica Canada. https://www.thecanadianencyclopedia.ca/en/article/jean-wilson. Accessed 25 April 2019. Jean Wilson, speed skater (b at Glasgow, Scot 19 July 1910; d at Toronto 3 Sept 1933). After winning international honours, she died of the muscular disease myasthenia gravis. Wilson started SPEED SKATING when she was 15. 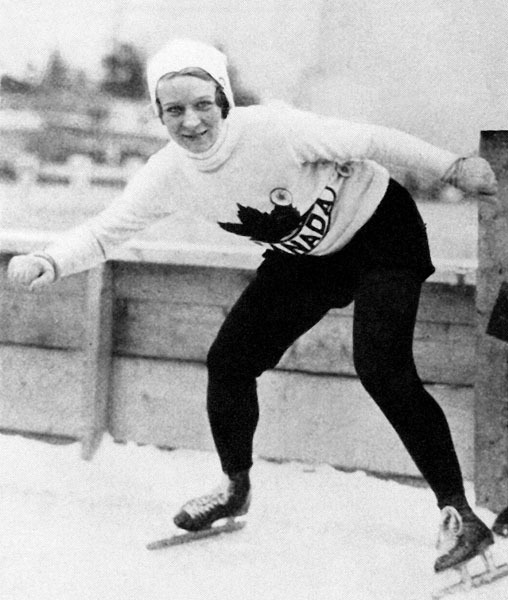 Canada's Jean Wilson participates in the demonstration women's speed skating event at the 1932 Lake Placid Olympics, placing first in the 500m and second in the 1,500m races. Jean Wilson, speed skater (b at Glasgow, Scot 19 July 1910; d at Toronto 3 Sept 1933). After winning international honours, she died of the muscular disease myasthenia gravis. Wilson started speed skating when she was 15. A strong, natural skater, by 1931 she was able to challenge the sport's reigning queen, ​Lela Brooks, and prior to the 1932 Winter Olympics established herself as N American champion. At the Olympics in Lake Placid, in which speed skating was a demonstration event, she won the 500 m event. Although she set a world record in the 1500 m in her preliminary heat, she was closely beaten by America's Kit Klein in the final. She fell while leading the 1000 m race. Within months of the Olympics, she entered hospital and battled her rare disease for a year before succumbing at age 23.